For other uses, see Garam masala (disambiguation). 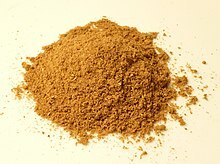 Garam masala (Hindi: गरम मसाला; Marathi: गरम मसाला; Punjabi: ਗਰਮ ਮਸਾਲਾ; Gujarati: ગરમ મસાલા; Urdu: گرم مصالحہ‎; Bengali: গরম মসলা) from garam (“hot”) and masala (a mixture of spices) is a blend of ground spices, originating from the Indian subcontinent, common in cuisines from the Indian subcontinent and Mauritius. It is used alone or with other seasonings. The word garam refers to “heating the body” in the Ayurvedic sense of the word, as these spices are believed to elevate body temperature in Ayurvedic medicine. There are other types of masala, like tikka masala and tandoori masala. The composition of garam masala differs regionally, with many recipes across the Indian subcontinent according to regional and personal taste, and none is considered more authentic than others. The components of the mix are toasted, then ground together. ^ a b c Rama Rau, Santha (June 1969). The Cooking of India (Foods of the World). USA: Time Life Education. ISBN 978-0-8094-0069-0.